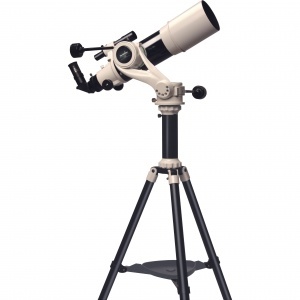 Ideal No Fuss, Grab-and-Go Telescope for Easy Visual Astronomy as well as Daytime Terrestrial Observations! The STARTRAVEL-102 is a two-element, air-spaced achromatic refractor and a well proven performer for Ä__Rich-Field' views of comets, star fields, star clusters, nebulae, bright galaxies & planets, the Moon and the Sun (with proper safety filtering!). The supplied erect image diagonal provides an upright, fully corrected image allowing the telescope to be also used for terrestrial observing. The elegant, well engineered and easy to use AZ5 Deluxe Alt-Azimuth mount provides excellent stability and precise control, via its slow motion cables, on both the horizontal (azimuth) and vertical (altitude) axes.